The other day I was exploring the East Pasadena area again. I stopped to have a coffee at Peets. FREEBIE ALERT!! In celebration of their 40th year anniversary, all through April, Peets is giving out free coffee during 1pm-3pm (at least this one in East Pasadena is). I would highly recommend any coffee lover to trek over during your "office break" or have that "offsite meeting" during the hours of 1pm-3pm in April. I remember drinking Peets up in Berkeley a long time ago. I used to grab some beans from Peets whenever I was inthe bay area. Peets was a necessary stop back then. Who knew that years later, I'd be able to enjoy a cup of Peets and get the beans right here in East Pasadena. In the back area on the Rosemead Blvd. 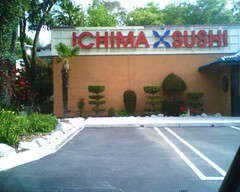 side, I found a Sushi joint called Ichima Sushi. I didn't have any high hopes. I was thinking could they have a lunch special? Well, I walked up to the front and was checking out the facade when I saw the neon lights in the porthole-shaped windows. I saw one in particular on the side that made me laugh. I had to take a picture. 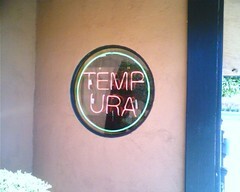 I then quickly walked away - I wasn't sure I wanted to try that place out anymore. See what I mean? It's always enjoyable to check out the local Farmers Markets. Every Friday late afternoon to evening, there is an Eagle Rock Farmer's Market happenning off Colorado and Casper - near Eagle Rock Blvd. This is a smaller Farmers Market - if you are used to the Hollywood Farmers Market or Santa Monica Farmers Market. And, its also a little swapmeet-like - there's a vendor selling socks. I never have been able to get out there in the early evening when the sun is out because I'm just perpetually late. Don't ask... The market has its family-friendly charm, even has pony rides and a petting zoo for the kids, and a lot of ethnic street fair food. 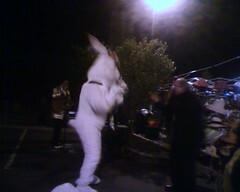 I've gone a few times at night and I have to tell you, I've experienced some of the most comical, surreal moments there! Like on Friday the week before Easter, there was an Elvis impersonator MC in a gold top doing his act, occasionally breaking into impersonating Arnold Schwarzenegger during lull periods. 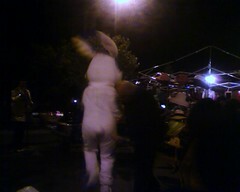 At one point, a giant Easter Bunny hopped in, interrupting the MC and then proceeded to dance salsa with some random people. I got the pics to prove it! I was just sitting there eating and laughing in disbelief. You just have to get out there and check things out and sometimes you stumble onto some surreal stuff. Anyhoo, what kind of chow do they have at this shindig? Well, you got your usual Kettle Popcorn, Roasted Corn, Funnel Cakes, Crepe and Sausage/Hot Dog booths. Other usuals that I've seen there thus far have been Peruvian food, Giant Tamales, Mexican food, Philippine food, and a Rot Chicken booth. 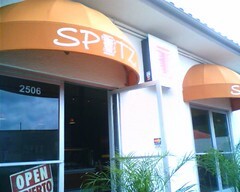 Some booths I've seen in rotation here - Peach Cobbler (with the awesome tagline - So Good You'll Want To Slap Somebody!) and Soups On (check out lunch at the Hammer Museum courtyard sometime - very good soups might I add). 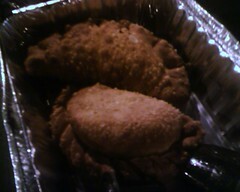 The empanadas were okay - they were fried. I prefer them baked. 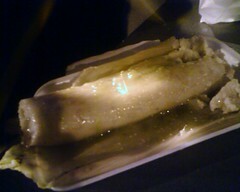 The tamales were pretty good with the tomatillo sauce. These tamales are huge and substantial. The biggest I've ever seen. I ordered a few extra to take home and freeze. 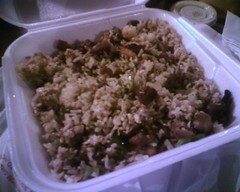 The Chaufa de Pollo was okay. Definitely not Mario's Peruvian. But let me say that I don't come to the Farmers Market as a destination for that great dish. I come for the local street vibe, hang with the locals, to buy some fruit, veggies or nuts, to enjoy the weather, and grab something to eat while relaxing. And one of the perks at the Eagle Rock Farmers Market is that just around the corner is the Colorado Wine Company! The other month I was exploring the west-side "Colorado" so I went exploring on the easternmost side of Colorado - as easterly as I could go. 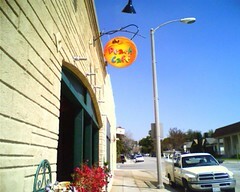 I found a neighborhoody joint called Peach Cafe right before Colorado turned residential in Monrovia. This place is located on one of the streets off of the quaint Monrovia Myrtle street (which I shall be exploring in the future). The interior is spacious and open like a downtown LA loft - on one side a counter, dessert cases, and an open kitchen. 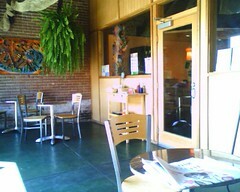 You can see their rainbow colored signage in the picture and there is matching artwork over the walls. Sorry, I wasn't really into the artwork. But the menu looked like pretty good American fare. 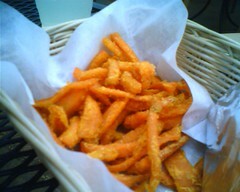 They tout using fresh high quality ingredients for their menu - they even had a menu insert talking about it. It was sunny in the afternoon for a change so I opted to sit in the Front Patio. Since they serve breakfast all day, I was debating between a breakfast or lunch. Luckily, I completely avoided this awful conflict by deciding that I would come back again prior to posting. I love the way my conflict resolution instincts work! 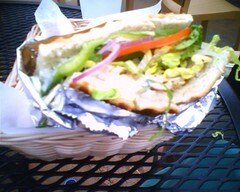 So I went for one of their lunch specials of the day - a Honey Dijon Chicken Panini. 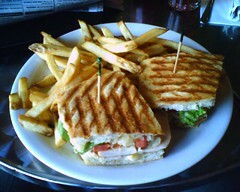 The Panini was off the hook! The fresh bread, toasted to crunchy perfection on the exterior. Inside, melted pepper jack, chicken breast, lettuce, avacado, and tomato along with a sweet and hot effect of the honey dijon sauce. 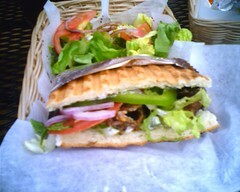 Last month, I ate a Panini at Zephyr Coffee House. The difference? 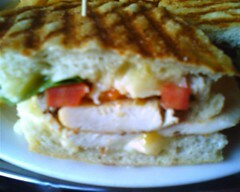 If you are hungry and hankering for a Panini - come to Peach Cafe. If you need to get away from the hustle and bustle and go some place to chill and possibly stay for a while doing other things than eating, and/or see some more interesting artwork, and while you're there you want to eat a lite lunch - then go to Zephyr. Now onto breakfast... Peach Cafe does a good breakfast which is served all day. 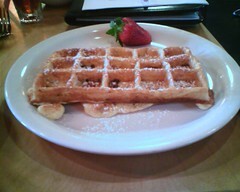 Check out this "half order" of the Hictory Maple Waffle. I almost cried when I took a bite. 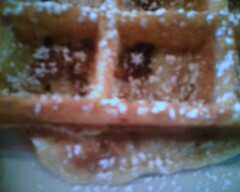 This waffle was perfectly waffled - the batter contains some cornmeal and maple syrup. What is also unique is that they also put bits of thick smoky bacon in the batter. Check out the other closeup photo! The dark spots are the bacon bits! OK. I confess. I went a third time to get a breakfast, because I had to bring another person to see and taste this waffle. This was on a weekend when they have some special menu items for brunch. 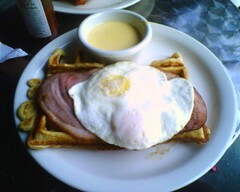 I saw the Peach Cafe Benedict - egg, ham on... you got it, a hickory maple waffle, with a cheese sauce. I was intrigued, so I had to get that. But I ordered the cheese sauce on the side - which I would highly recommend doing. I liked all the individual parts of the benedict, but the cheese sauce was a bit too much for me - I was happy that it was on the side. They certainly do not shy away from the butter here. I prefer maple syrup to the cheese sauce.